Born in Richmond, Virginia, in 1943 while the South was still strictly segregated, tennis player Arthur Ashe went on to become the first, and so far the only, Black man in history to win singles titles at both the U.S. Open and Wimbledon, as well as the Australian Open. Forbidden from playing football by his father, Ashe started playing tennis on a segregated playground at the age of seven. His ability caught the attention of the best black tennis player in Richmond, Ron Charity, who took the talented youngster under his wing. Ashe competed in his first integrated tennis competition at age 13 when he become the first African American entered into the boys' championships in Maryland. However, Ashe was often barred from competition as a young man because of his race. Ashe attended UCLA on a tennis scholarship, where he graduated with a bachelor's degree in Business Administration. In 1965, a year before graduation, he won singles and doubles titles in the NCAA tennis tournament where he was the third-ranked player. 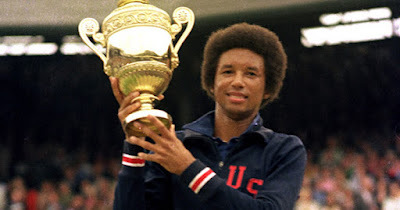 After a brief military stint following graduation, he competed in the 1968 U.S. Open and defeated Tom Okker of the Netherlands to become the first African American champion in men's singles. In 1975, he defeated fellow American and heavy favorite Jimmy Connors at Wimbledon, becoming the first black man to claim the title. Aside from his tennis prowess, Ashe was known for his humanitarian work, campaigning against apartheid in South Africa and establishing tennis programs for inner-city children. Sadly, he contracted AIDS from a tainted blood transfusion and passed away in 1993.